The most direct award goes to local New York noisemakers in Gnaw. It's easy to make esteemed vocalist Alan Dubin (you know his other bands) a focal point here, but Gnaw is a competent collective regardless of his input. His ominous voice is incredible, make no mistake, but Gnaw is not just a consolation prize for people who miss Khanate. Brooding, swaying streams of sound filter and burst through from behind dirge-like doom structures, making something that sits just outside of most boxes it could be placed within. At times, things veer into the more structural side of industrial music, but the irreverence of Gnaw makes even the most direct things appear to be heavily altered. It swells without becoming unwieldy in its scope, a teetering and tenuous experience that remains just grounded enough to stay contained and consistent. Gnawed, while similarly noisy, is the only outright actual noise act presented here. Those of you who keep aware of modern death industrial are already sure to be familiar with this project of Minneapolis resident Grant Richardson, but for those not yet in the know, you're welcome. The monstrous and overwhelmingly vast atmosphere of Gnawed's newest work, Ruin, should be a lot to take in, but presents itself in a surprisingly digestible fashion. In the midst of songs that feel more like abandoned, ruined cities, there are still moments of somber peace in songs like "North of Lock" (near the twenty minute mark on side A in the stream above) with an eerie semblance of melody. Last year's Harm was also an absolute mandatory listen, if this entices you enough. Suffice to say, this is one of the more fascinating death industrial or dark ambient artists performing today. Gnaw Bone is the freshest group in this collection but is equally worth your attention with their hideous, stomach-turning doom. Without forsaking form or clarity, Gnaw Bone offers up four tracks of ugliness on Scorched Earth. Bands like this often get pegged with the "misanthropic" tag, but I feel that'd be selling this short and a little bit off-center. The roaring fury here is more aligned with all-out world-ending chaos than it is an emotion. When humanity's nuclear ambition fails and the world is engulfed by whatever hell we unlock, the title track will seem more prophetic than "metal" in its scope. The hypnotic force of this should be noted by fans of all things unsettling and apocalyptic. Bonus points for keeping things gross while still maintaining crisp and clear production. Gnaw Their Tongues is probably the most well known artist we'll explore here, which is why it's saved for last. It's almost pointless to introduce Mories/Maurice de Jong, as his body of work has given him amply massive respect and acknowledgment despite the sheer malice with which so much of it is delivered. This recent profile done by bandcamp itself gives a great point for dipping your toes into many of his projects beyond just Gnaw Their Tongues, but I'm electing to share the first album of his I came across. 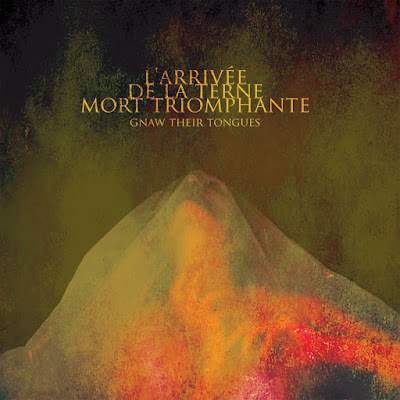 I'm not sure anything I'd heard before L'Arrivée de la Terne Morte Triomphante comes close to the degree of dread and majesty conveyed simultaneously on each of the album's tracks, blending funereal doom and black metal with martial industrial and chilling choirs. It's disgusting but impossible to ignore and inherently fascinating. As an album that manages to balance its grotesque nature with something truly gorgeous, it revels in its own excess. This is likely a familiar album to most readers, but still deserves your time and attention.